Boesman: Hey, what about Rosie? Nice name, Rosie. Boesman and Lena is one of those rare film experiences that leaves you almost speechless. Since I need to write about this one, this is not necessariily a good thing... but I'll certainly do my best. In fact, I can already think of one positive thing to say: Boesman and Lena really gives me hope for the future of cinema. Often times I worry that maybe things are becoming too commercial, with so much emphasis on making money and/or having a film that is manufactured to appeal to a particular demographic. I fear that the art of filmmaking might become too dehumanized with time. But with inspirational pieces such as this one, my fears begin to dissolve. 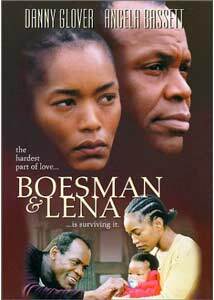 Based on a stageplay by the famous South African writer/director/actor Athol Fugard (Master Harold and The Boys), Boesman and Lena is a very stylized, structured piece about a horribly dysfunctional couple (Danny Glover and Angela Bassett) forced into homelessness and indignity by the state of Aparthied. The film essentially takes place in one location, by a river outside of Cape Town, where Boesman and Lena are forced to the mudflats when their makeshift village is destroyed by the police force (which is revealed in flashback). As they attempt to piece together some kind of home on the riverbed, Lena reveals her discontent with the situation in lengthy monologues. It is quickly obvious that Boesman has become abusive and cruel, far beyond his origins. As the two of them argue and hash out their differences, we see elements of their past lives revealed in short but potent flashbacks: how they met while working on farms; how they were driven to the slums of Cape Town by the effects of racism and, how they eventually came to live in this state of near-insanity and alcoholism. While Boesman and Lena are confronting their life this way, an old tribesman (Willie Jonah)—who cannot speak English—arrives at the mudflat. Lena interprets everything he says as a prelude to asking about her life, so in his silence, he becomes a sort of confessional for both of them. This is basically how the story is told, very much like a stage play. The brilliance of this film, however, is how director John Berry crafts it so that it never feels stale or boring. Although 90% of the story takes place in a limited area, the creative camera usage, character blocking, and amazing photography make it come alive. Although the flashbacks of Boesman and Lena's marriage are short, they are so well constructed that they convey their message with complete accuracy. Of course, one would also have to mention the devastating and amazing performances by both Angela Bassett and Danny Glover. They become their characters and embody everything they stand for. This caliber of brilliance is the stuff that legends are made of, and is easily award-worthy material. As a play, Boesman and Lena has enjoyed a great deal of critical acclaim, but this film truly elevates the source material into something few achieve. Boesman and Lena is easily one of those great stage-to-screen experiences, in the vein of Who's Afraid of Virginia Woolf?. What really struck me here was the fact that Boesman and Lena manages to be a scathing indictment of the Apartheid-based South African government without even being about it. The underlying message is that these two people, once a loving couple, would have never sunk to this place were they not demeaned by racism and displaced by the system. Sadly, this is the last work by director John Berry, whose promising career in Hollywood was ruined by the Communist Blacklisting. He moved on to working in other countries, and established a very good reputation, but never really wanted to come back to American filmmaking. He died shortly before the completion of Boesman and Lena, but certainly this last work is a triumph. He commands the material from the very beginning with complete authority and intimate knowledge of his craft. At least we have the comfort of knowing that Berry ended his career on this note. While a part of me wishes that Boesman and Lena should be on a pedestal, it seems much more impressive out of the mainstream spotlight. As it is, we have a quiet, but powerful masterpiece that goes right to the heart of many modern issues, without being specifically about them. Image Transfer Review: Boesman and Lena is a double-sided presentation, with widescreen on one side and pan&scan on the other. The widescreened, 2:35:1 side (the original format) looks extremely nice, but is not anamorphically enhanced. Regardless, the image is very clean and crisp, and there are only minor blemishes on the source print. There are no instances of artifacts or pixelization, but I did detect some edge-enhancement in a few areas. Although the same quality appears on the full-screen side, the loss of composition in the picture is totally unacceptable. The film was definitely crafted for the widescreen medium, using wonderful shots and careful planning. This crafting is totally lost in the pan&scan version and makes the widescreen side the obvious choice. I appreciate the choice Kino has given customers, but in this case, viewers should see the film the way it was intended. Audio Transfer Review: The Dolby 2.0 Surround audio is about as good as a mostly-dialogue film can get. Nothing is harsh or obscured, and the surround channels are often use for minor ambience (crickets chirping, wind blowing). The sparse, but masterful musical score also comes across with a lot of depth and tonality. The mix is well used for the most part, and shows that time was taken to actually use the medium, despite the fact that there is no "action" in the classic sense. Interview with Danny Glover and Angela Bassett. Interview with John Berry and playwright Athol Fugard. Extras Review: The two central features are short interviews with actors Danny Glover and Angela Bassett, and an interview with John Berry (shortly before his death) and Athol Fugard. The Glover/Bassett interview has them mainly dicussing their interpretations of the play and how their characters evolved into what they are. We get a lot of insight into how they decided how to make their characters suitably intense. Of course, Glover is no stranger to films about victims of Apartheid, especially considering his role in the groundbreaking Bopha!. The Fugard/Berry interview is more of a touching discussion between the two. They've known each other for many years, helping each other produce various things, and they mainly recollect how they came to make Boesman and Lena on film, and John Berry goes into detail about how honored he is that Fugard let him make the movie. The disc also contains the original trailer as well as biographies/filmographies for Bassett, Glover, Fugard, and Berry. The keepcase insert has chapter listings and a short tribute essay to John Berry, written by Athol Fugard. Boesman and Lena is a superb drama that isolates the absolute minimum requirements for making a film, and pushes those elements to their limits. Although very close to its stageplay roots, the movie breathes with its own soul and energy in a way that only the best of cinema can do, yet wisely does not become overlong or preachy about its internal messages. A must-see.